I had been champing at the bit to write about Tim Sherwood but after this last weekend, it feels a little more like a necessary procedure akin to having root canal treatment. Damn it though I’m an analyst, to some at least, and come hell or high water one must continue. Sherwood, despite widespread unpopularity amongst Tottenham fans dismissive of his win percentage, showed humility and decency in his special one-on-one Match of the Day interview. With a glint in his eye joined merrily by the tiniest yet most obvious smirk he may well have provoked a little ire but he brings a certain appeal that if not quite box office is certainly worthy of soap opera. He has returned to our lives in the guise of Aston Villa manager and has quickly posted a 37% win percentage- an instant improvement on the 20% Paul Lambert accrued thanks to an aversion to creativity and goalscoring. He’s back, he’s got his striker scoring again and as such Goal of the Month competitions have resumed at Villa Park, but what’s under the hood for our Tim? Firstly, Lambert presided over one of the most miserable Premier League seasons in recent memory. A sub-five percent conversion rate meant that a proverbial grandmother could have come in and improved the situation. An ideal gig for a confident and confidence-orientated manager? For sure. A few choice numbers there but revealing, in particular when held up against league averages as shown. Each of these statistics I feel are a reasonable proxy for how Tim Sherwood sets up his teams and the way he approaches football matches. We can see that in both his jobs the conversion rates for and against have been high, the rate of shots created and allowed that are on target is extremely high and the goal totals in games have clearly exceeded league averages. To those of us who watched the back end of Tottenham’s 2013-14 season, none of these points will come as a surprise. 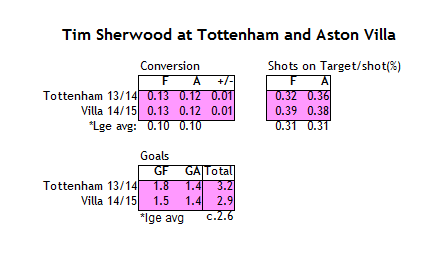 Sherwood regularly entrusted 19 year old Nabil Bentaleb to a nominal defensive midfield role. Alone. Meanwhile five more attack minded players endeavoured to wreak havoc ahead. Some of these set-ups appeared naïve, or even ill conceived, and they provided mixed results. So much so that when combined with an over willingness to share in the media, his departure was not mourned widely. Sherwood’s methods appeared to sacrifice control at the altar of chance and his gung ho attitude was too nerve-wracking for supporters more recently acquainted with the prescriptive stylings of Villas Boas. He has found a similar scenario at Villa and seemingly approached it the same way. 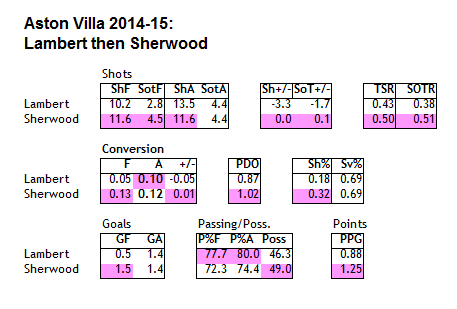 Paul Lambert’s latter period was characterised by some extremely cautious, even negative, ball retention and Villa often played as if they feared losing. This is no longer the case. The reality of a 3-3 draw at home to QPR as Redknapp protégés slug things out shows where the football has headed for Villa. And weirdly, this might not be a bad thing. Whereas Sherwood’s methods ultimately fell short of requirements at Tottenham, they could well be exactly what is needed for a club battling relegation. “You win some, you lose some” is a hell of a strong maxim for a team that hasn’t been winning many at all and deserved to win fewer. His current early record of 3-1-4 will do them just fine if maintained and suggests that “having a go” is at least, a short term fix. It isn’t particularly technical, it might end in tears but Sherwood’s magic is simple: pump up your chest, glue your heart to your sleeve and get out there and play like you’re worth it. 1. Chelsea are limping but what does it matter? Since trouncing Swansea 5-0, Chelsea’s form has been decidedly less impressive. It will likely mean nothing as Arsenal and Man Utd have taken too long to flourish but with little impact from score effects, to have been outshot by a combined 52(17) to 29(7) in their last three away games against West Ham, Hull and QPR is head-scratchingly non-creditworthy. Taking all nine points from those fixtures means “who cares?” and the trophy engraving has likely been scheduled. 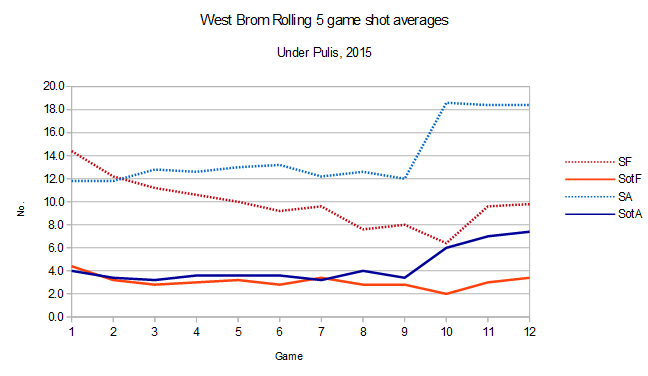 Our model gives Newcastle a 99.5% probability of finishing below 4th and above 18th in EPL. Mike Ashley will be happy with that. Maybe I’m being harsh? In isolation I’d agree but Newcastle are coasting once more and the blueprint does not include this kind of form early season, a potential situation which will surely require remedy over the summer. Won’t it? Sure, the City game ruined this, but it was heading for the rubbish tip anyway. Tough times at the Hawthorns.